Ingham Village Hall hosts a number of events throughout the year including Jumble Sales, Quiz and Chip evenings, Harvest Supper and Christmas Bazaar to name a few. We also have a number or regular clubs held at the village hall. Read on for descriptions and contact details. If you would like to hire our hall, details are at the bottom of this page. Friday 4.00pm – 8.00pm Street Dance from 4 years to teen. In an attempt to re-start Ingham Art Club, we are having sessions on the first and third Tuesday each month from 2-4pm until September to see if it is viable. Ingham Bridge Club meet to play Rubber Bridge at a relaxed, rather than serious level. We are a friendly club and welcome new members. It is not necessary to bring a partner, although of course a partner is also welcome. We play for 1p per hundred points, so in addition to the visitor’s table fee of £2 one must be prepared, on a “bad” day to lose around 20p. However, winners are requested to place their “winnings” in a charity box in support of the Quidenham Children’s Hospice, (EACH). Regrettably, we have no teaching facilities, but if you are an “improver” or above you are most welcome to join us. Wednesday afternoons at 1.00 pm. For more information contact John Love, Secretary, on 01692 584250 or David Willits on 01692 580616. A wide range of craft activities are undertaken. Why not drop in to a session? Visitors and new members are always welcome. YOGA for mature people – If you are interested in joining a possible class at the Village Hall, please ring 01603 736925 for details. Looking for a venue for your club, party, celebration or private/commercial event? 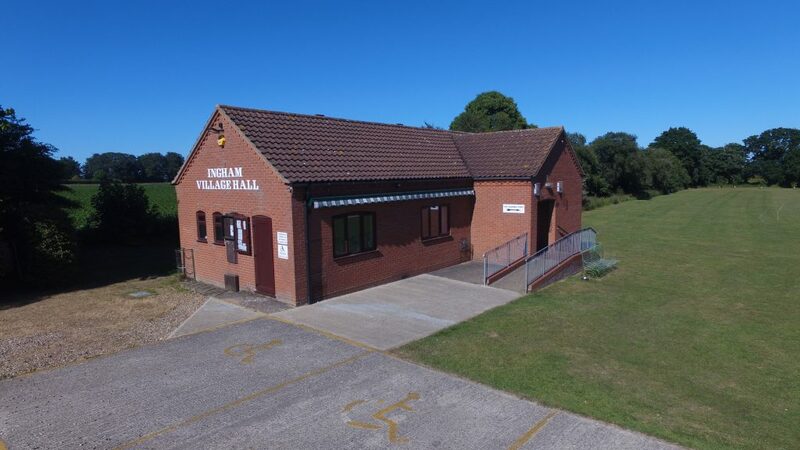 Ingham Village Hall and/or playing field is available to hire for your function. How about a ‘football party’ for the next birthday? Loads of room even for a ‘bouncy castle!! Ring 01692 580202 for availability. Click here for Hall Hire Charges and Booking Form.